The project activities have been executed under five work packages (WPs).The key tasks of each WP were: WP1 management of the project; WP2 – 4 processing of information and WP5 dissemination and communication. All activities have been executed within 36 months, so INSPIRATION was a 3-year project. WP1 and WP5 have been active throughout the whole duration of the project. WP2, 3 and 4 only for a limited period: WP2 started at the beginning of the project, and stoped when it delivered its input for the work to start in WP3. 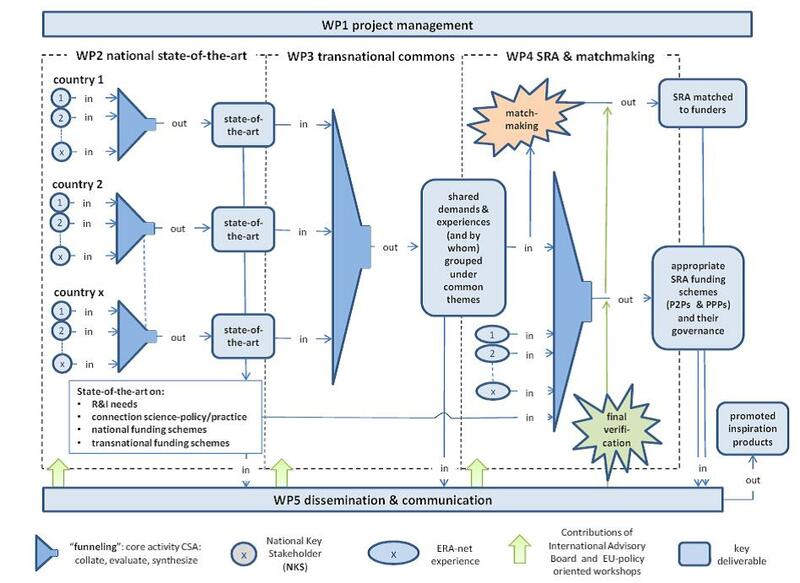 WP3 stoped when it delivered its input to WP4 which concluded its activities at the end of the project. A key-activity in INSPIRATION was – as it is typical for a Coordination and Support Action – the collation, review and synthesis of information. This iwas the core activity of WP2 – 4 and this activity is graphically represented as a ‘funnel’: collated information enters the funnel as ‘input’, where it is reviewed and synthesized. This was done mainly in workshops preceded and finalized by deskwork and working meetings with consortium members active in the specific WP. The synthesized information exited the funnel as ‘output’, i.e. key deliverables of the project.